Maybelline is 14.2h 2006 Premium Weser-Ems mare by Welsh stallion, Wedderlie Mardi Gras out of a Karon mare. She has her USEF permanent card at 148cm. Shown unrecognized with scores to 74%! This gorgeous pony is a big mover and has the talent to go in any direction. She is still green, but has the temperament for a junior or amateur. Her substantial build can easily carry an adult and take up a long leg. Maybelline is schooling training level dressage and has started leg yield, shoulder in and lengthenings. Hacks out quietly and has been successfully ridden and shown by a beginner junior. Has also been started over fences and is a calm and scopey jumper. Maybelline is safe and easy for anyone to handle. She clips, loads, and tavels well. She has been to large show venues and trail ridden off property. She is an easy keeper, barefoot, no maintenance. Very suitable for a junior or amateur to bring along with the help of a trainer. For information about each browband, click on it's photo. 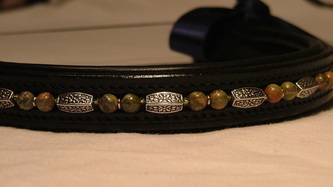 Custom browbands can be designed with a specific stone that you like or a particular color pallet. If you don't know where to start, send a picture of your horse, and we can make recommendations. Browbands are available in black or brown, straight or V-shaped, and Cob-Oversize. 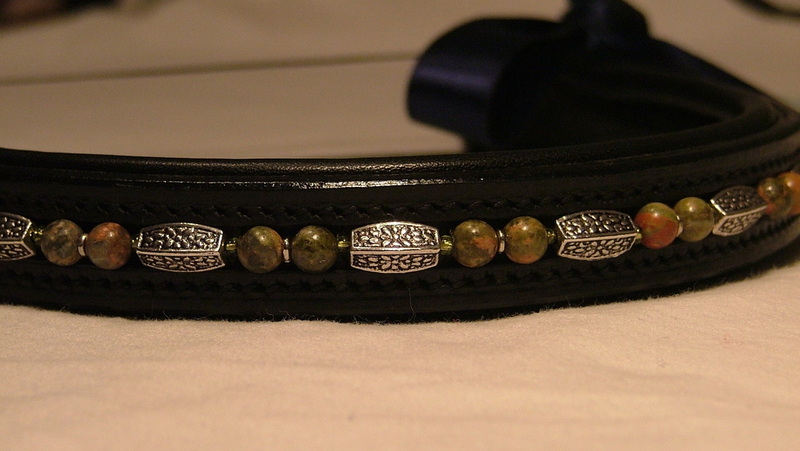 To make a purchase or place an order for your custom browband please email or call Katie at 410-259-4165.